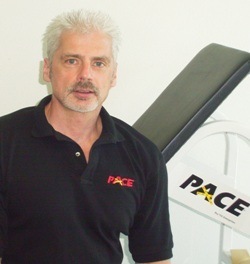 Rande LaDue, distributor of PACE hydraulic exercise equipment, is seeing a fitness industry trend: independent express fitness clubs opening in markets and locations that could not sustain a Curves franchise. 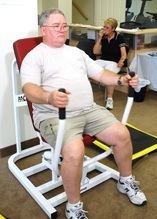 PACE sells hydraulic exercise equipment like the machines used in Curves franchise clubs*. In fact, the first Curves club in Harlingen, TX originally used PACE equipment, according to LaDue. Ironically, PACE is finding a new niche where Curves clubs are struggling. One of our biggest areas of growth right now is selling into markets where a Curves club has just gone out of business. There may have been 50-60 loyal members who loved working out but have been left high and dry; maybe this was not enough members to cover the high franchise fees, but usually more than enough to cover basic expenses. Independent clubs pay no franchise fees or royalties. How could an independent club – with no established branding or name recognition – survive where a powerhouse like Curves could not? The most obvious reason is cost. Independent clubs cost less to start, and less to operate. In some low-volume locations, that cost difference could be the difference between success and failure. According to the Curves website, the cost of a Curves franchise is $24,900 (new equipment) or $19,900 (refurbished equipment) with delivery of the Curves equipment ranging from $3,000- $5,000. A PACE new equipment package is well under $15,000, with training included (normally a $1000 option). Independent clubs pay no franchise or advertising royalties, as opposed to yearly costs ranging from $3480 to $14,280 Curves owners must pay. Additionally, Curves owners have other costs, including mandatory purchases and program participation costs. Independent clubs have freedom to experiment. Franchises like Curves are based on conformity and compliance; they build their brand by enforcing consistent standards throughout their international network of clubs. Curves franchise owners do not have the freedom to, say, add a line of retail products on their own, or to promote their club as co-ed. In smaller, extra-competitive or nuanced markets, finding new and creative ways to add revenue or grow membership may require out-of-the-box initiatives that would not be approved by a national franchise. In recent discussions on UnhappyFranchisee.com, some Curves owners have complained that they have trouble retaining members who plateau and/or get bored with the non-adjustable Curves hydraulic equipment, yet they are prohibited from going to weight-based machines or even the adjustable hydraulic machines offered by PACE. Curves franchises face stiffer penalties for failure. The penalties for failure also seem to be greater for Curves owners than independent operators. Many comments by Curves owners here (see the comments on Robert Lay’s Story) cite the fact that they are pressured to pay closing or “failure” fees if they cannot remain open for the full term of their agreement, and that they are pursued for “future royalties” despite having done their best to keep their Curves clubs open. There’s no doubt that Curves pioneered the concept of circuit-based express fitness clubs. However, many, many franchise clubs are fighting for their survival in oversaturated or underpopulated markets. Where these clubs cannot survive, independent clubs – unburdened by franchise fees, royalties and corporate mandates – may be able to thrive. If they do, the independent owners and suppliers like PACE will have Curves to thank. * According to LaDue, PACE equipment differs from the Curves machines in that PACE equipment can be adjusted to increase or decrease resistance. ← KITTY LITTER DELIVERY: Hot New Franchise? We have all seen the devastation that comes from owning a franchise that is run by a corrupt, unethical, immoral, and crooked owner such as we all believe Howie to be. We have banded together on this site to get the word out about this company so others won’t make the same mistake we all have by falling for the lies, and dishonest treatment by the sociopath, Howie. The number of clubs closing is not only disheartening but frightening when you stop to consider how many people have lost everything including their homes and retirement funds and they continue to close at an alarming rate. it is now time to start a campaign to lobby our government officials to change and strengthen the laws on franchising for the franchisee. I am suggesting that everyone write not only the President but their senator and congressmen as well. If you click on the sites listed below it will take you to where you can send an email to our elected officials and we need to tell them about our experiences we have had with Curves and demand that the franchise laws be changed. [Note: the WH email page requires a U.S. State and Zip Code to submit. Howe is still refusing to allow clubs to offer it by saying it is against the franchise agreement and clubs that offer it will be terminated. How long will it be before he figures out a way to make money from it and allows clubs to offer it? Gee according to the WSJ article owners are allowed to think out side the box. Hey someone should inform Howie of that as he is still threatening to terminate contracts if you offer Zumba classes………Hey Howie do you smell the roses yet or is that the winds have changed and your smelling your upper lip. Time is running out Howie!! What are you and Diane going to do now Howie? Hid on your 1000 acre ranch??? You can hide but you can’t run and the lawsuits are comming at you fast and your time is almost up. Howie you need to get a new PR firm as now every owner knows what and who you are and you aren’t a christian Howie. It’s time you got pruned!!!!!! The WSJ article has been a long time coming, but it does look like the beginning of the end of the Curves “Con” now that the mainstream media is investigating them. We in the Fitness Industry have seen this coming for many years as Curves sold their bill of goods and inferior equipment to unsuspecting entrepreneurs. As a matter of fact, international fitness expert Craig Pepin-Donat wrote this about Curves in his book “The Big Fat Health & Fitness Lie” in 2007, “When your only option is to use the same equipment that cannot be adjusted, you are going to plateau and get bored with the program very quickly”. Now, its only a matter of time…..
Well I would have to agree with Rande LaDue for the most part. It has been a long time in coming and it does look like the beginning of the end of Curves. But I would beg to differ on the causes as we never in over 10 years of operation had any complaints on the equipment and reaching a plateau or getting bored was never a problem in our clubs. But I do believe it is only a matter or time and the big question is how long can Howie hold out and try to stay afloat? Will the rumors of Diversified buying them out become a reallity or will he file for bankruptcy? Will some other company buy him out and if so who??????? Has any owners heard more about the rumor of Diverified buying out the Curves franchise ? Many owners are closing and than reopening the next day as a different club. Here is what some owners are saying on different sites about that. franchisor who is actually interested in what’s going on out in the field! First off, why if you leave Curves would you want to go to another franchise?? Isn’t that one of the chief complaints in having to pay franchise fees. Second, who’s to say that the founder isn’t someone like Heavin? He talks about being a successful chiropractor, but I wonder he his FDD discloses his bankruptcy earlier in the decade. You’d think that Unhappy would do a little more research. Maybe people should start questioning what is stated by him on here. Seriously? Why would anyone who got burned by Curves buy into another fitness franchise… especially now that they know the business? I must say I agree with Say What; after a negative experience, why jump from one franchise to another? DISCLAIMER: I sell PACE and Kids PACE Express hydraulic equipment- however, one of the most common things I hear from customers is they love the fact that we are not a franchise. We give them all the tools & training to help them become successful, but they are free to run their clubs any way they like- and they keep their profits. We have been doing this for many years (long before Curves existed) and we have seen a lot of women’s club franchises come and go. It looks like Curves is going to be one of them. As I’ve stated before many owners are closing and becoming independent clubs and are thriving because they are than allowed to got out side the box and promote changes in their clubs to become more competitive within the market place. Some owners have even saved their clubs by becoming 24/7. It is obvious to all Curves owners that part of the reason Curves has failed is because Curves will veer too far from the 30 minute circuit and Howies stubbornness against change that isn’t his idea. When owner’s tries to think out of the box Howie threatens them with termination of their franchise agreement even though there is nothing in the contract that would hold up in court to prevent the owners from doing so. I would agree with Rande LaDue, that Curves appears to becoming a statistic in a long list of closed heath franchises. I am happy to report that as Curves clubs continue to close all over the world, independent club owners are enjoying success. Just this month, we have sold equipment to three different groups of former Curves members who banded together to put indie clubs into the same locations vacated by Curves clubs. All three clubs already have enough members signed up to pay their monthly overhead! Without the franchise restrictions, they are able to offer programs/services like Zuma classes, cardio equipment, babysitting, coed hours, etc. One group even added our kid’s equipment to offer a family express club. If anyone would like more info, please send an email to Admin and it will be forwarded to me. i want to but a curves, nobody seems happy about owner one. I’m i wasting my money and time, plase help me. Don’t do it! Yes you are wasting your money and time. Invest into something like FroYo. This place is the best!! http://froyoyogurt.com/about.html.